« Show Us the Waivers! So much for promises. Obama’s proposed budget provides just $200 million more for federal funding of the IDEA – a meager increase in the face of a funding shortfall that measures some $14 billion. As the chart below shows, the IDEA Part B (grants to states) appropriation is so far off the mark for “Full funding” that it doesn’t even equal HALF of the promised amount. 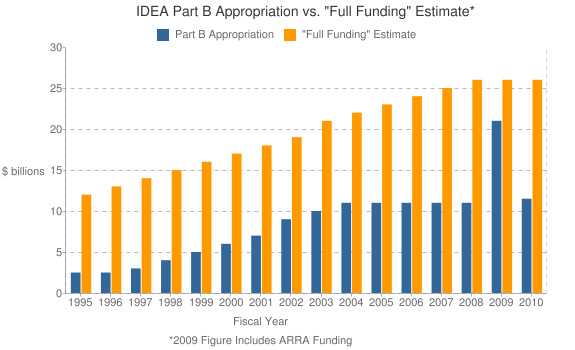 The possibility of achieving “full funding” of IDEA anytime in the near (or far) future seems extremely remote. The appropriators in Congress don’t seem to understand that this is a commitment to help offset the local districts’ expense of providing special education to eligible students with disabilities – not a program designed to boost student achievement, like so many of the programs funded by the U.S. Dept. of Education. In fact, contrary to the statement released with the President’s budget request, this $200 million increase will NOT “help to improve the quality of the education students with disabilities receive so they can participate in the general education curriculum to the maximum extent possible and are prepared for college and a career, or both.” Bottom line, this is really a “cost sharing” deal where one party isn’t keeping its end of the deal. The President’s FY2012 proposed budget shows that he has no intention of keeping his campaign promise. And the upcoming Congressional debate will likely show, once again, that the Congress also has no intention of keeping its promise. This entry was posted on Wednesday, March 2nd, 2011 at 3:26 pm	and is filed under Balance Sheet. You can follow any responses to this entry through the RSS 2.0 feed. You can leave a response, or trackback from your own site. Maybe you haven’t noticed, but the government is spending a little more money than it takes in every year. Around $1.65 trillion more. Just about every dollar amounts to a ‘promise” we can’t afford to keep. Sorry, bit everybody’s sacred cow is going to have to take a hit, including yours. That’s leadership — making tough decisions based on reality. — not breaking promises. Yes, we’re well aware of the deficit issues facing this country. And we don’t expect everyone to agree with our point of view. We do, however, feel that the Congress should either provide the funding it promises in IDEA, or remove the provision from the law, so that states and local school districts will know what they can expect.